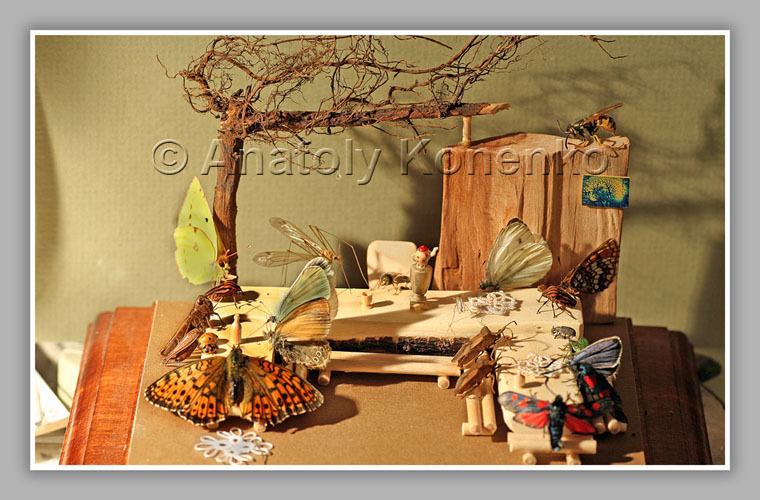 Performed on a cut apple seed. Watercolor. 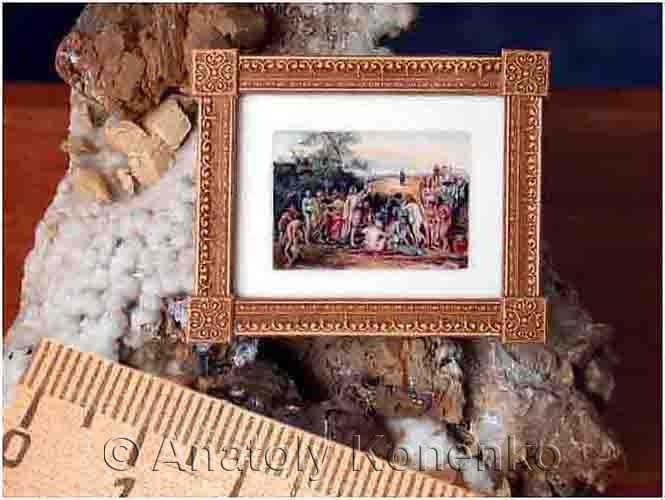 Picture Size 3.1 x 4.6 mm. Cherry pits. Three cars are made of gold. 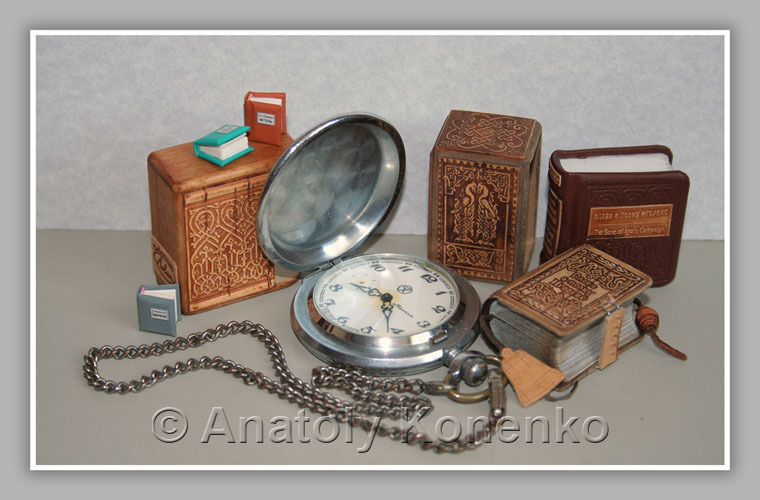 One sheet of birch bark books with self-portrait of Pushkin. 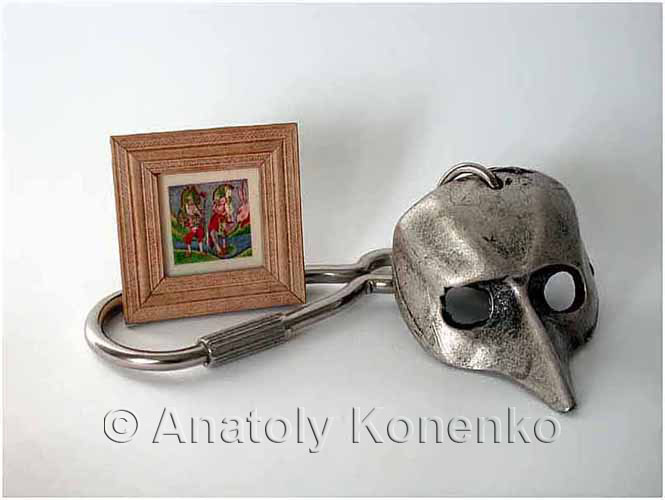 The book has 19 self-portraits. 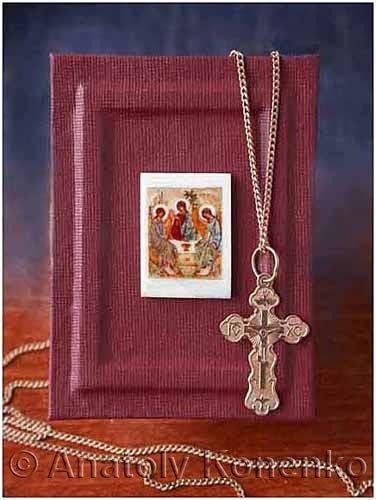 Page size 21.0 x 28.0 mm. 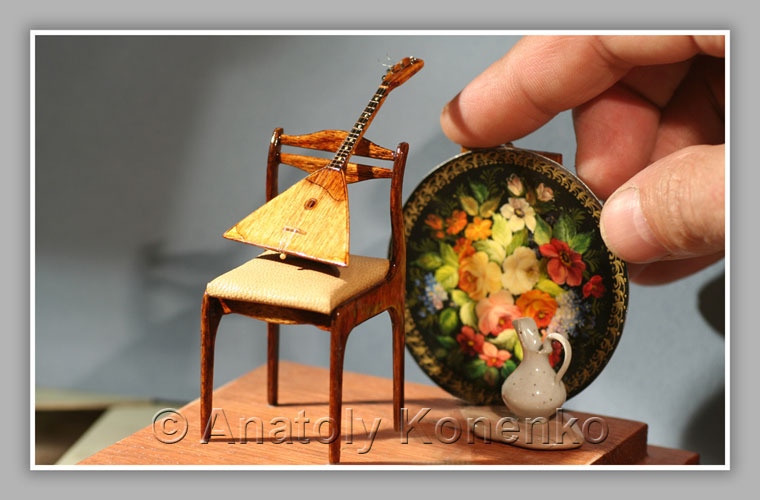 Balalaika on a grain of rice. 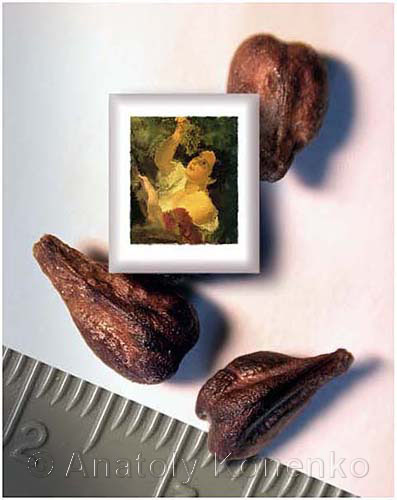 Executed from the shell of various seeds of fruit trees. Inside a tag with the name of the author, the name of the city and date of manufacture. Strings made of fiberglass. 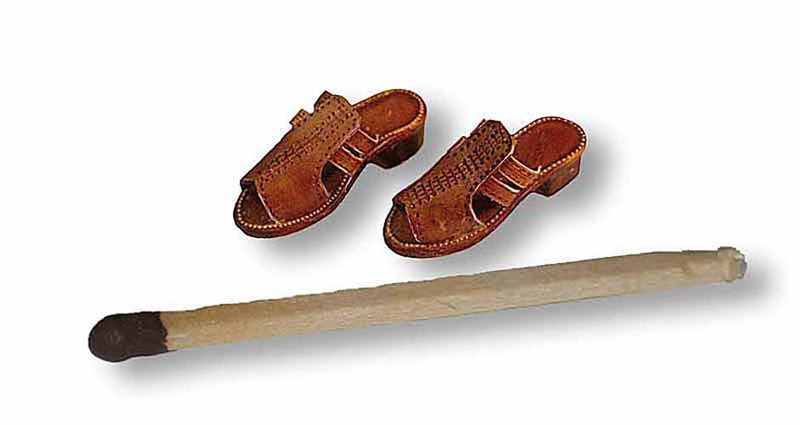 The length of the balalaika 3.45 mm. In the 40 000 times smaller than the original. 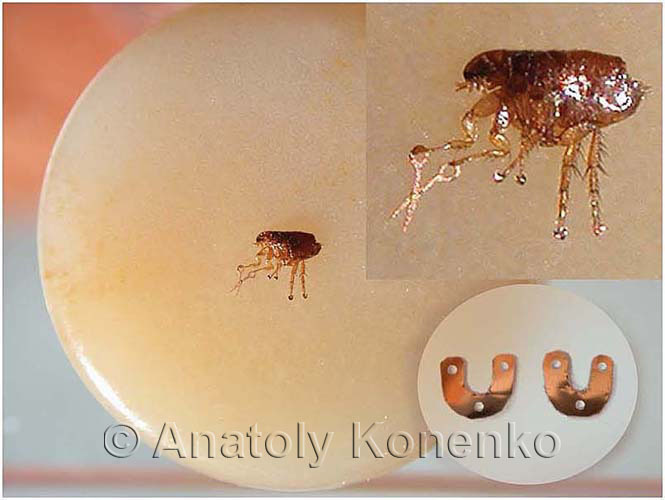 This flea shod with golden horseshoes rate of 0,25 x 0,2 mm. 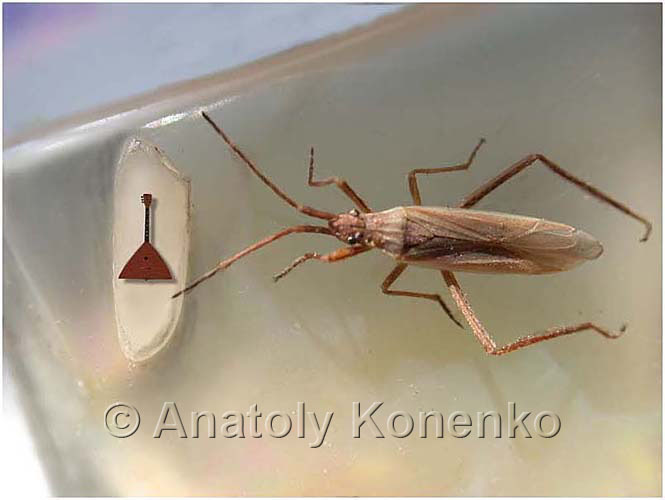 (Area horseshoe 0.05 mm, which is 6,000,000 times smaller than the horseshoe a horse). Three drill holes are drilled with a diameter 0.03 mm. 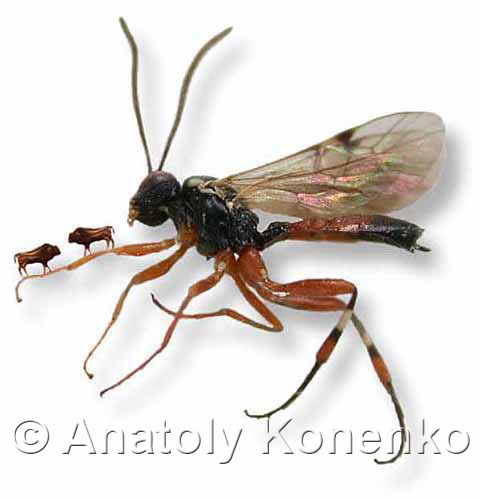 Technology development and manufacture of miniature tachenii lasted 7.5 years. 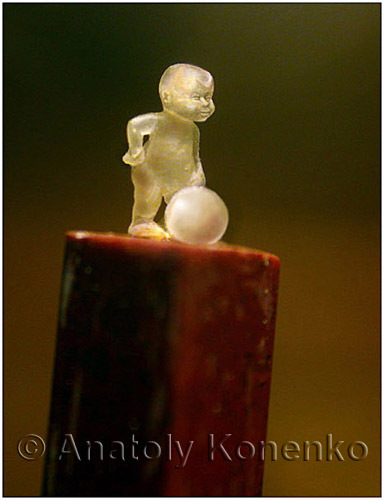 Height 4,2 mm sculptures. 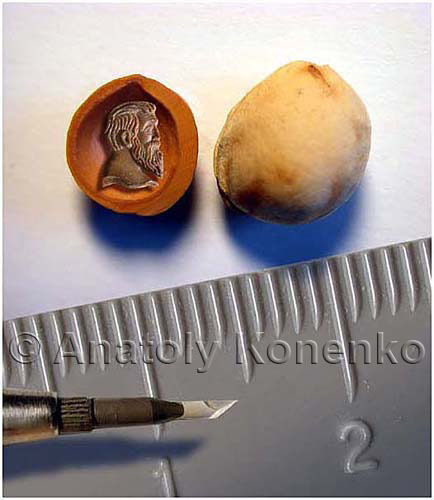 The diameter of the ball 1,2 mm. 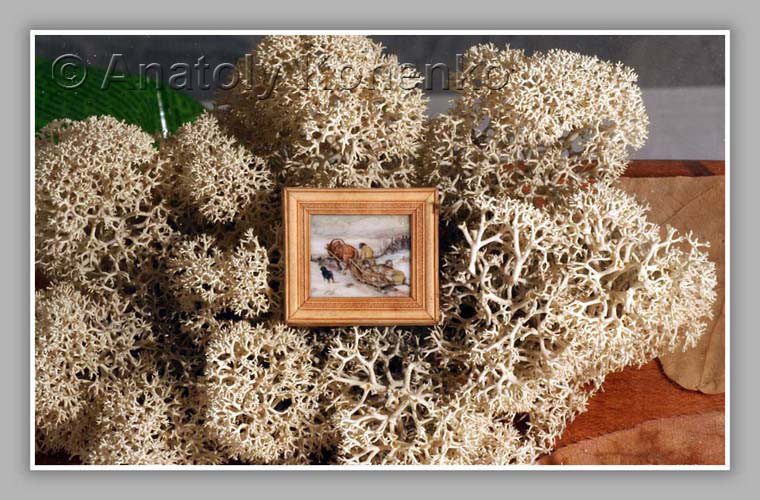 Microminiature with a picture of Repin. Performed on a plate made of mammoth bones. Watercolor. 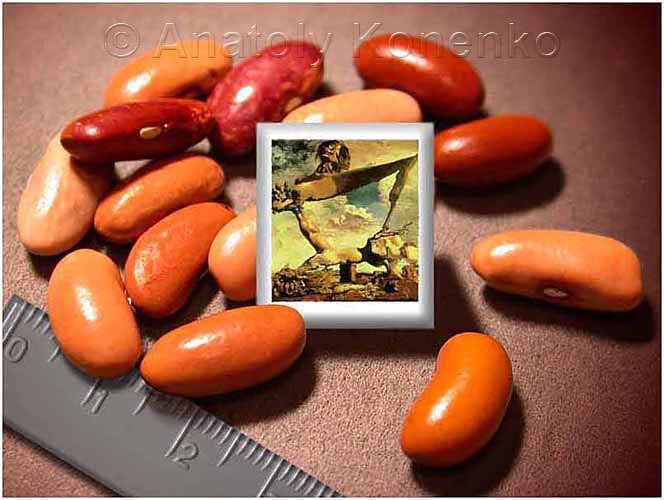 Size 22.0 x 10.0 mm. 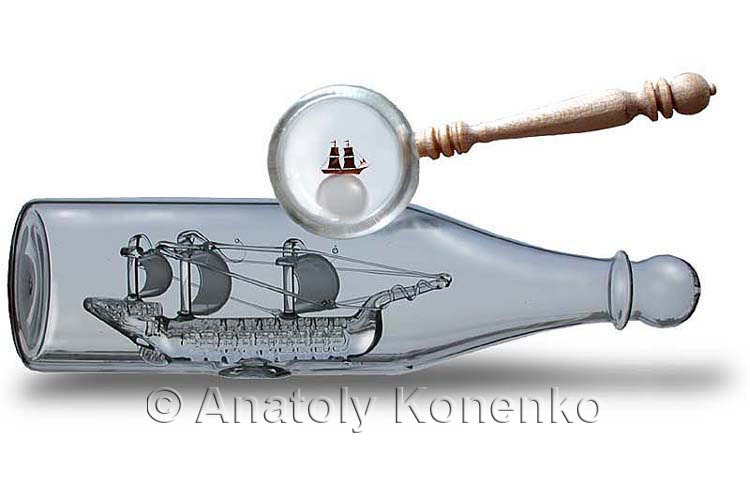 Placed inside a glass bottle on the sailboat mast height 34.0 mm. through the hole in 3 mm. 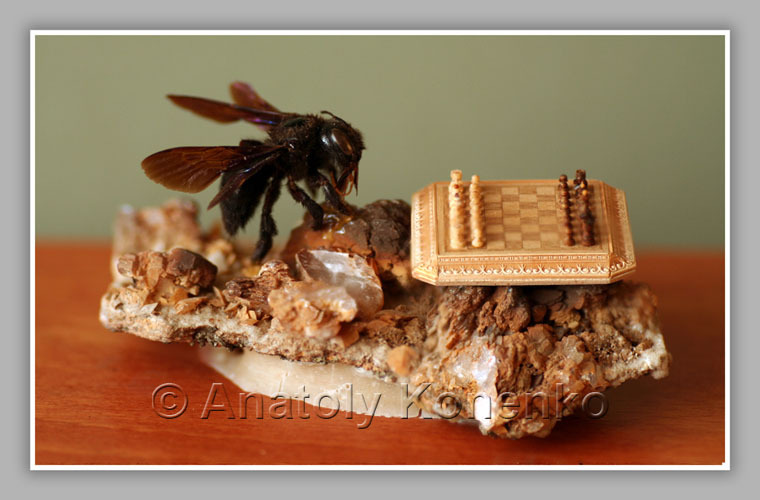 Miniature wooden carved chess under the microscope on a miniature lathe. 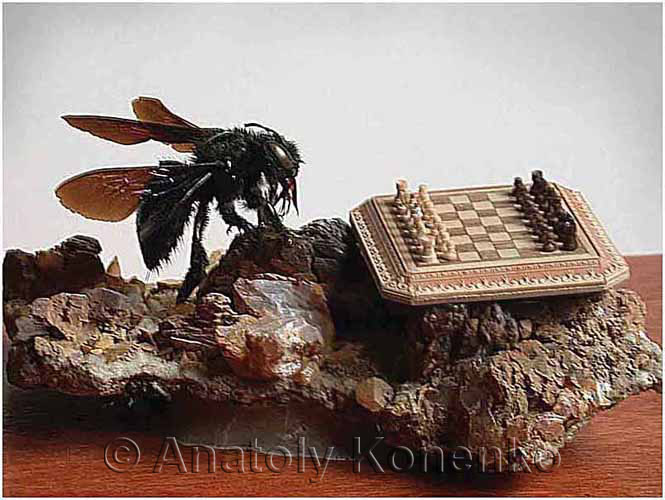 The height of the chess figures 2,0 - 3,8 mm. The playing field is 17.0 x 17.0 mm. 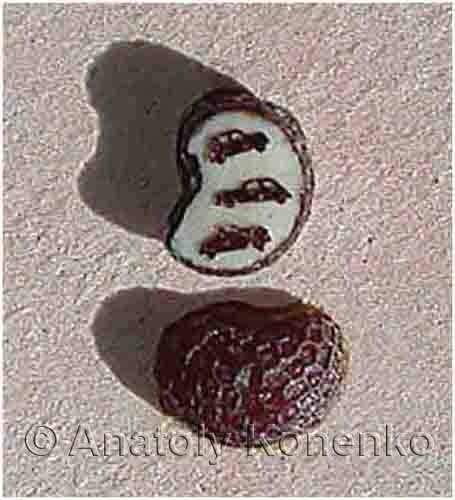 Cells chess docks of different tree species. 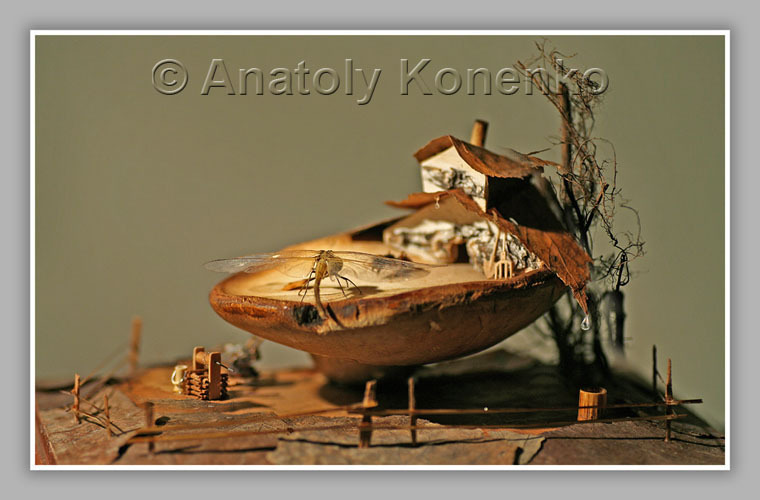 An ornament made of birch bark. Bumblebee real. 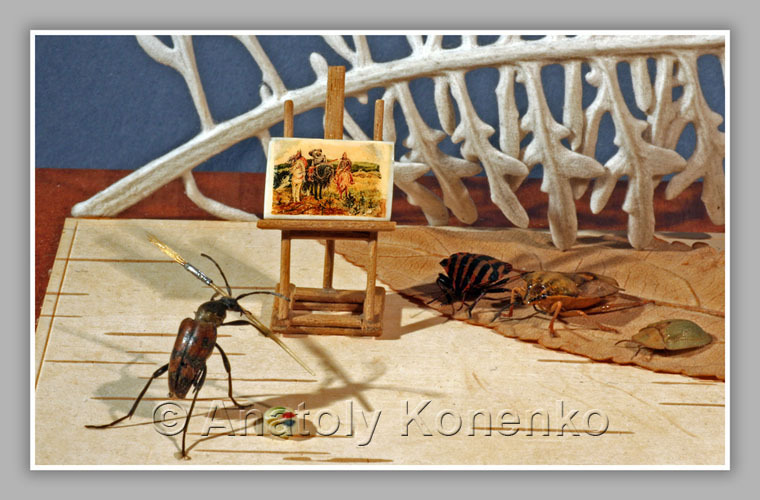 Microminiature with paintings of Salvador Dali. Performed on a plate made of mammoth bones. Watercolor. Size 14.6 x 14.9 mm. Executed in watercolor on the mammoth. Size 13.5 x 15.8 mm. 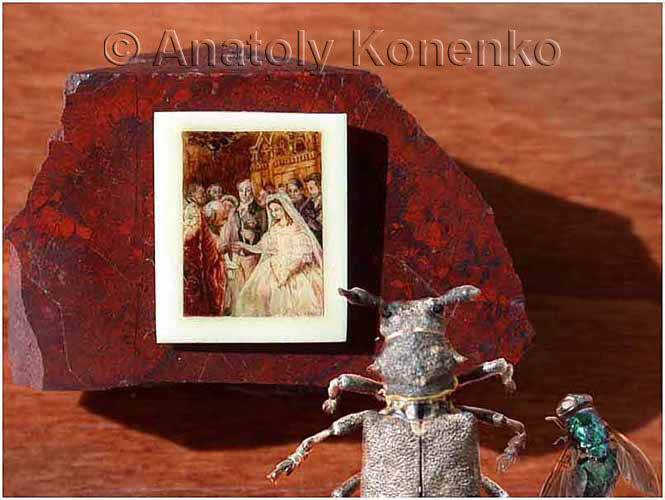 Microminiature with paintings by Auguste Renoir. Watercolor on mammoth. Size 10.2 x15, 6 mm. Dominoes made out of metal. 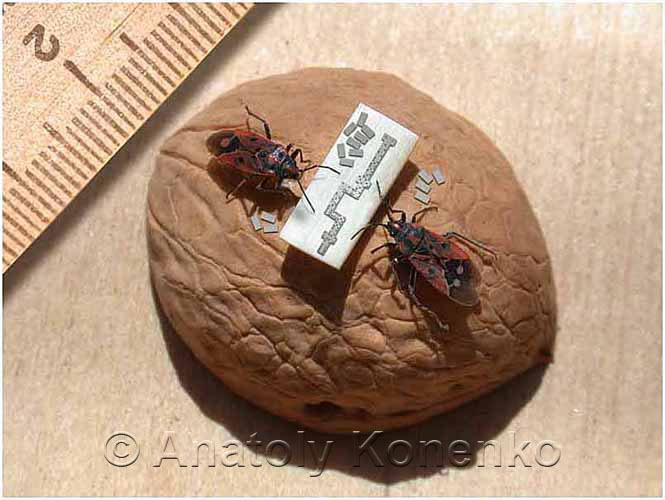 Size 0.6 x 1.2 mm. 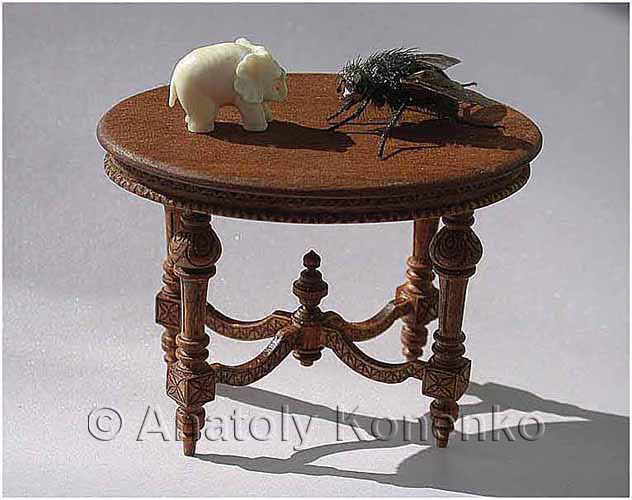 Table of mammoth bone is placed on half of a walnut. 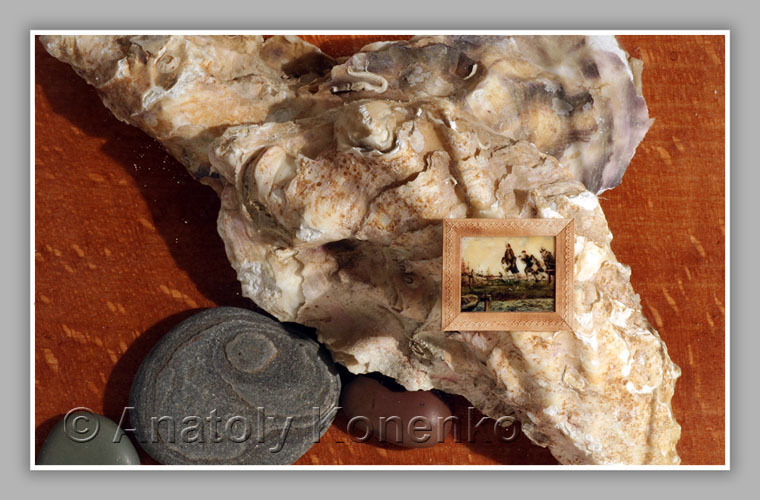 An icon "St. George and the Dragon"
Subminiature icon executed in watercolor on a plate of mammoth tusk. 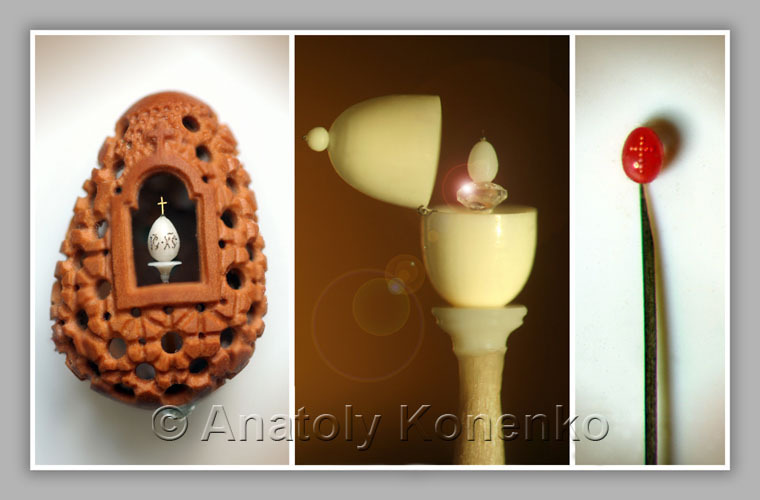 Size 1,3 x 1,8 mm. 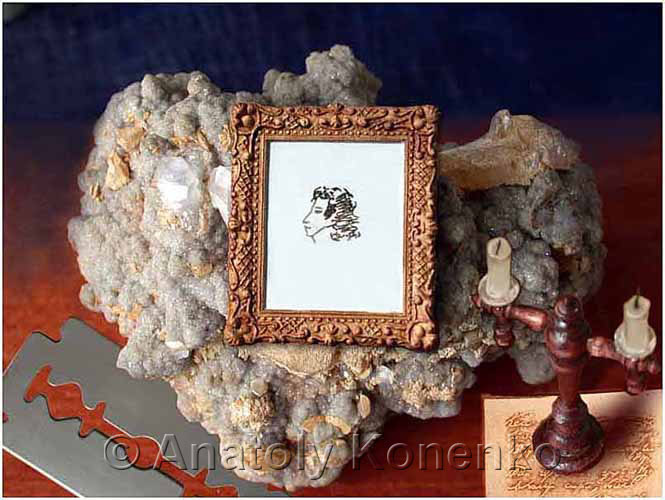 Microminiature with a picture of Charles Bryullov. 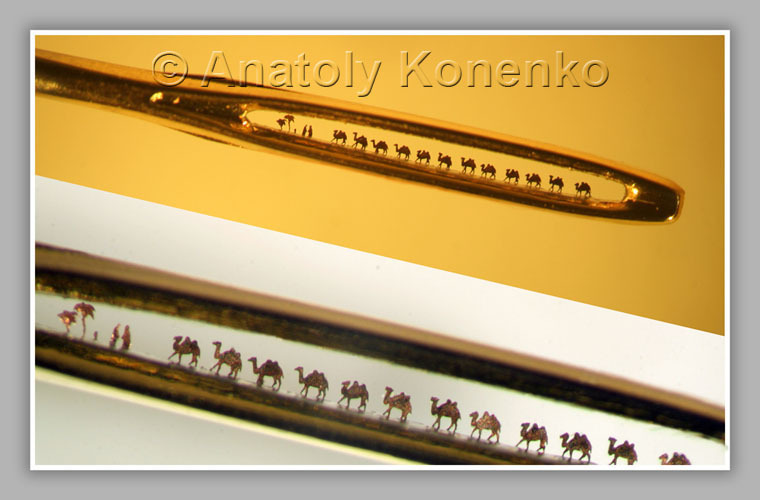 Figurines of camels and herders of gold. Height 0.25 mm. 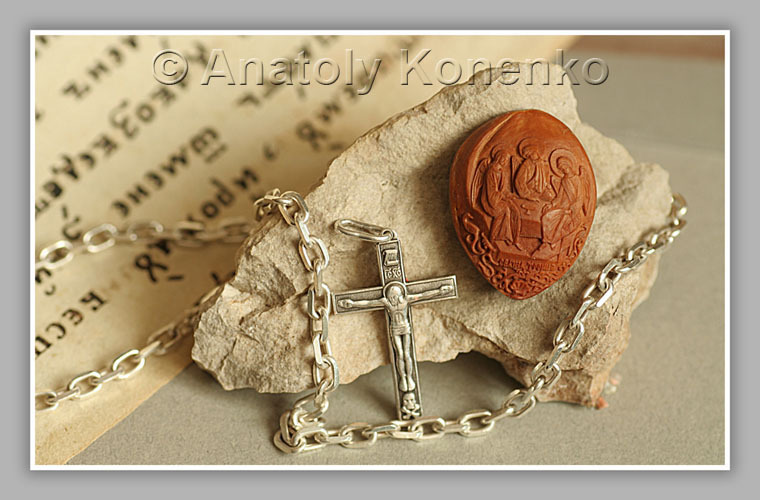 made of human hair, domes carved from walnut, the crosses at 22 domes of gold. 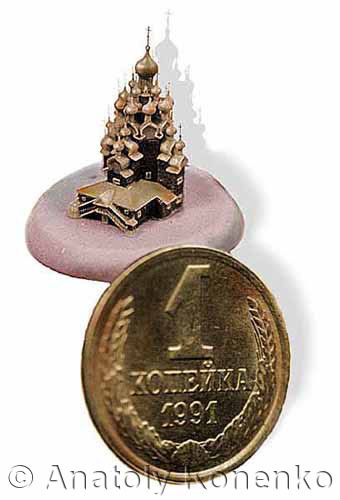 The height of the layout of the cathedral 9,1 mm. 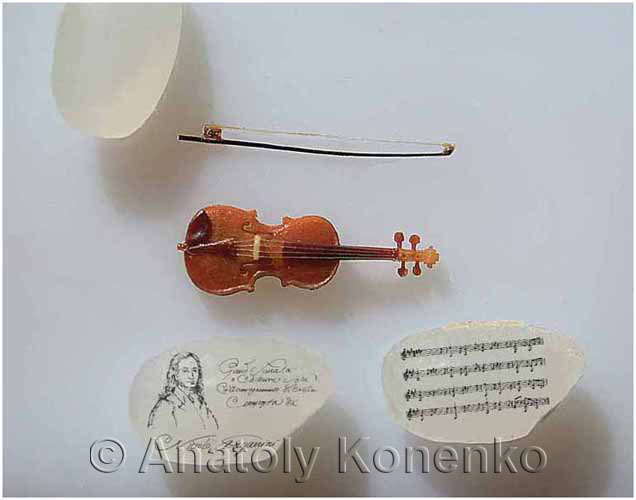 The violin has a length of 12 mm. 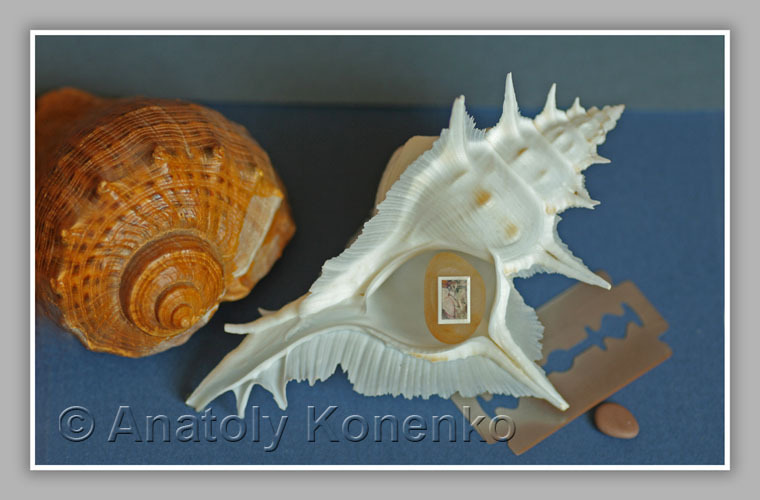 Is made of walnut shell, strings of glass fiber. 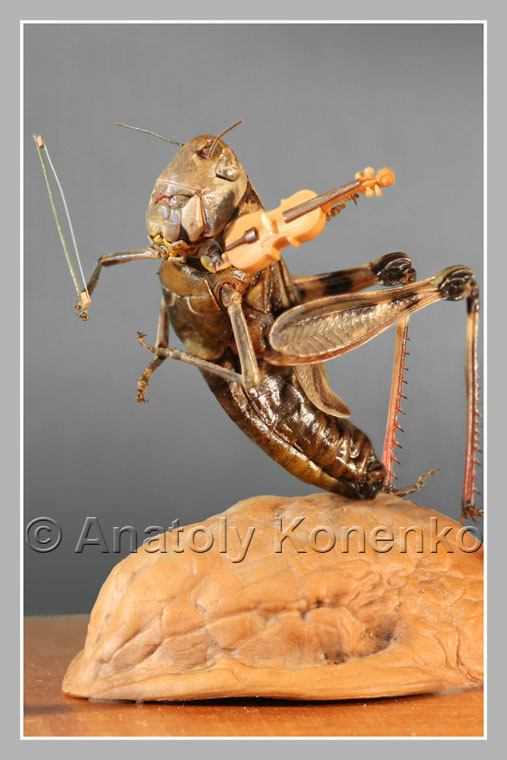 The violin has all the details of a real instrument. 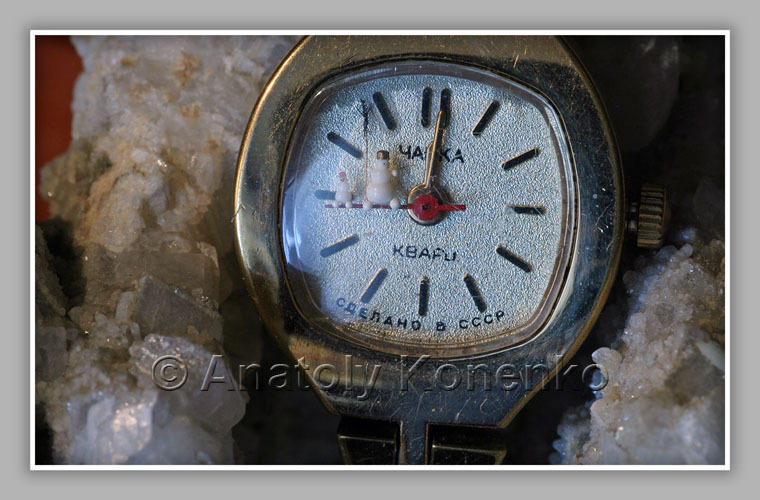 Placed inside birochka with author's name, date of manufacture, name of country and city. 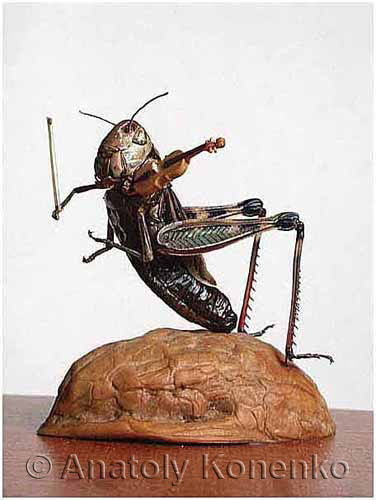 Grasshopper real. 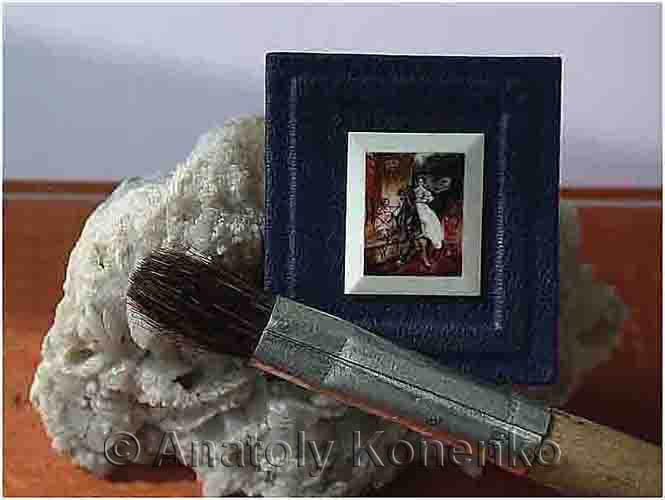 Microminiature with paintings of Vrubel. 11.0 x 7.5 mm, watercolor, mammoth bones. 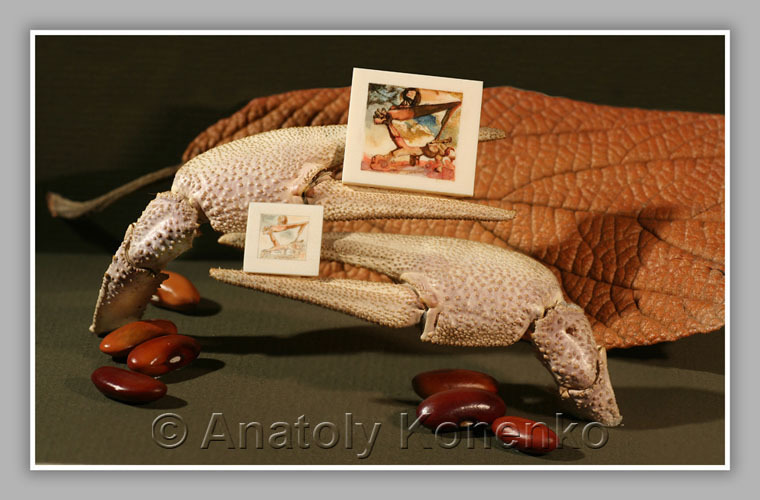 Miniature dolls carved from mammoth bone. Height dolls 5,0 mm, 4,0 mm, 3,0 mm. 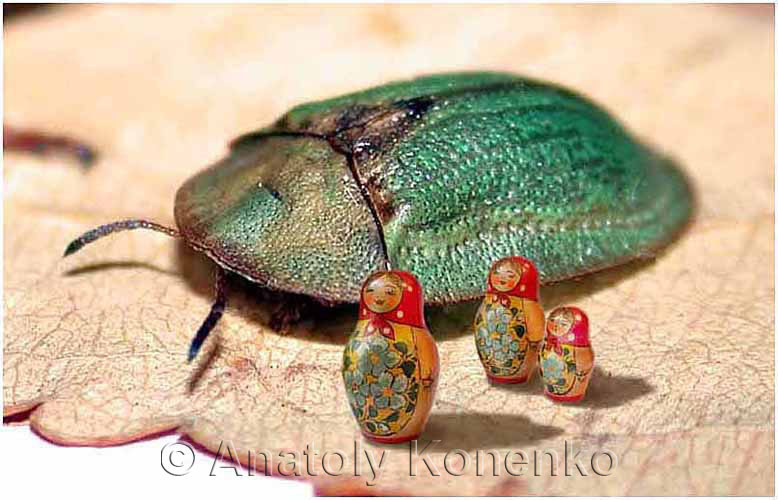 Is made of peach pits. 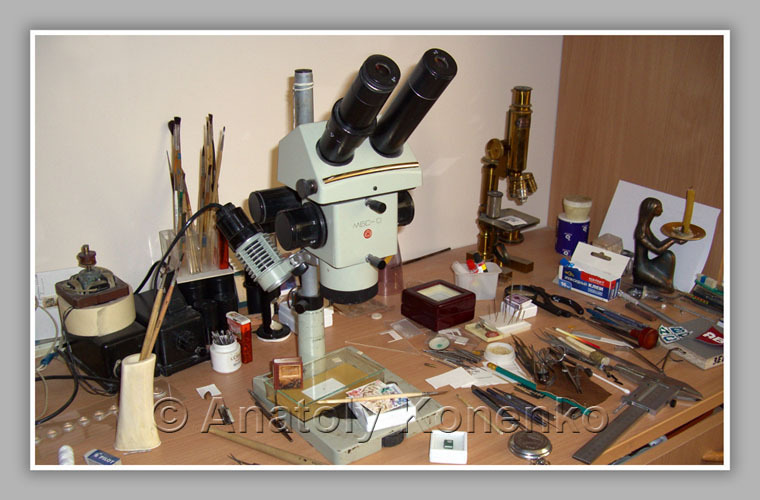 The work was performed using a miniature diamond cutters. 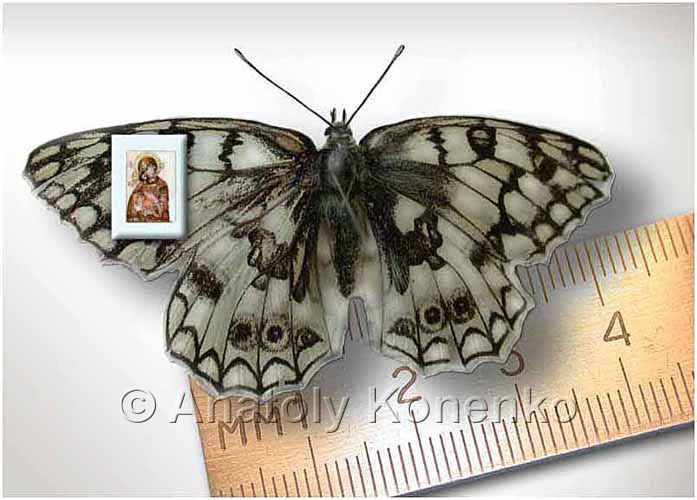 Size Portrait 3.1 x 4.5 mm. 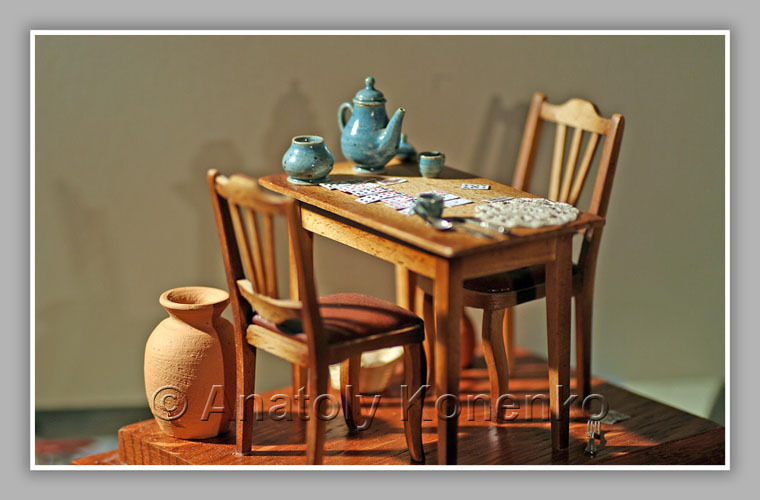 Table height of 34 mm. M 1: 24 (by world standards) is made of wood pear. Cover of rosewood. Elephant from mammoth bone. 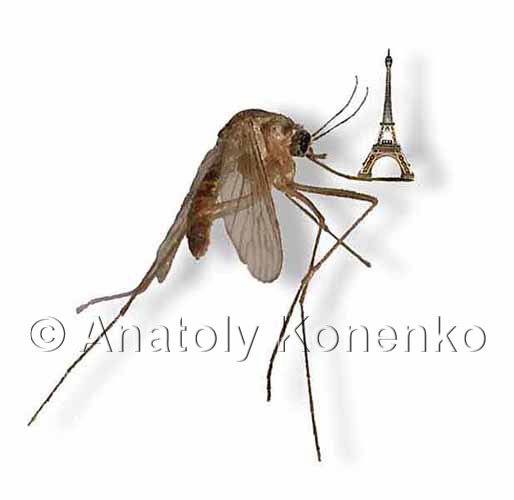 Fly the real thing. 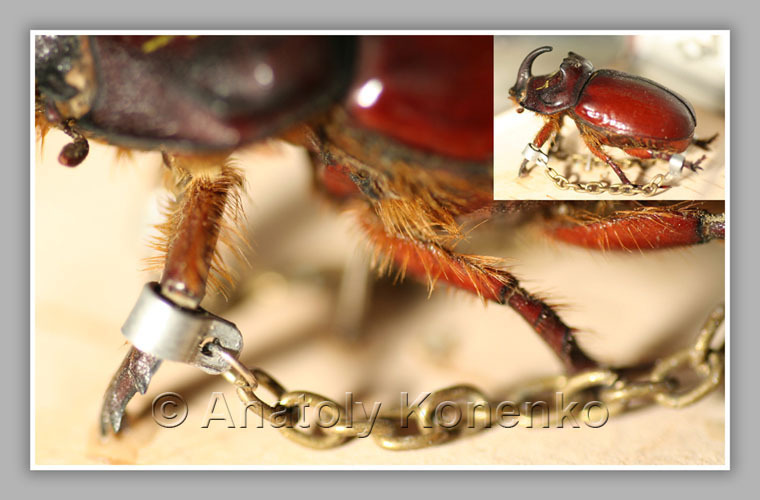 Of the finest plates of gold made the details lock and key. Key length - 0.24 mm, ring diameter - 0,1 mm. Castle 0.24 mm height, ear thickness - 0.012 mm. The height of the locking holes - 0.04 mm, width - 0.018 mm. Ant room was red. Its length - 2mm. 12.0 x 15.0 mm, watercolor, mammoth bones. 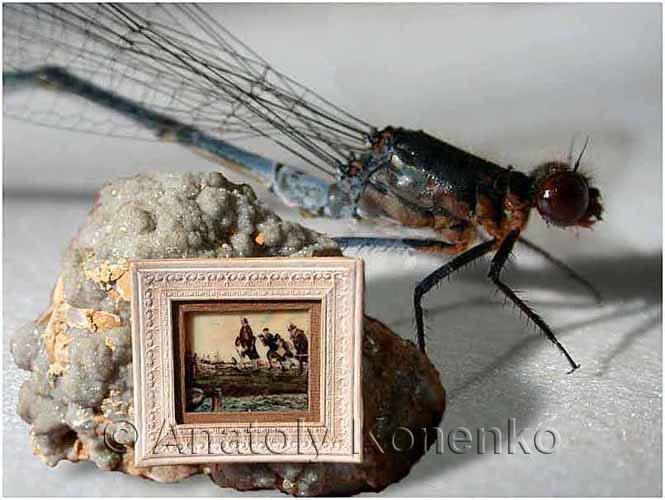 Microminiature with paintings of Venetsianov. 11.0 x 15.0 mm, watercolor, mammoth bones. Gold. 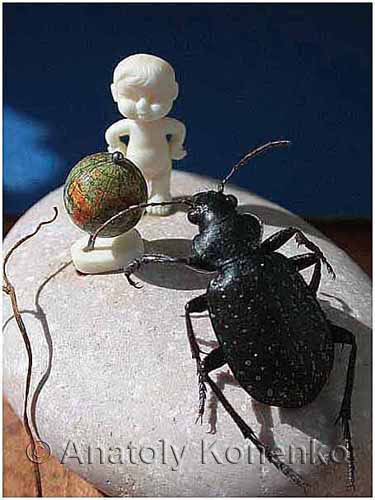 Height 0.23 mm figures. 11 x 16,0 mm, watercolor, mammoth bones. Work is done in watercolor on mammoth. 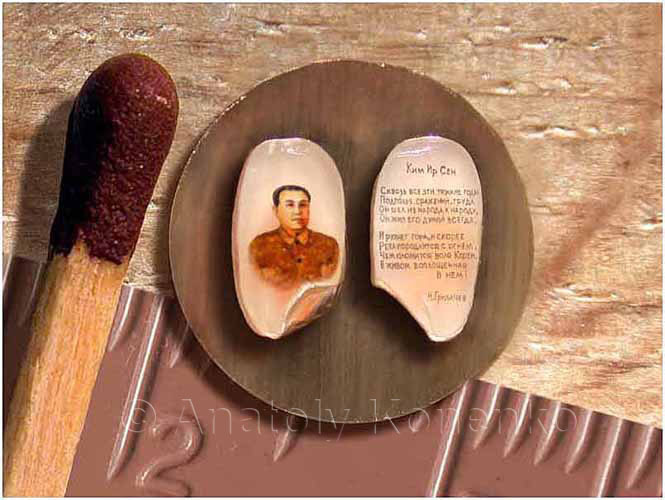 Size 3.6 x 7.2 mm. Frames made of birch bark. 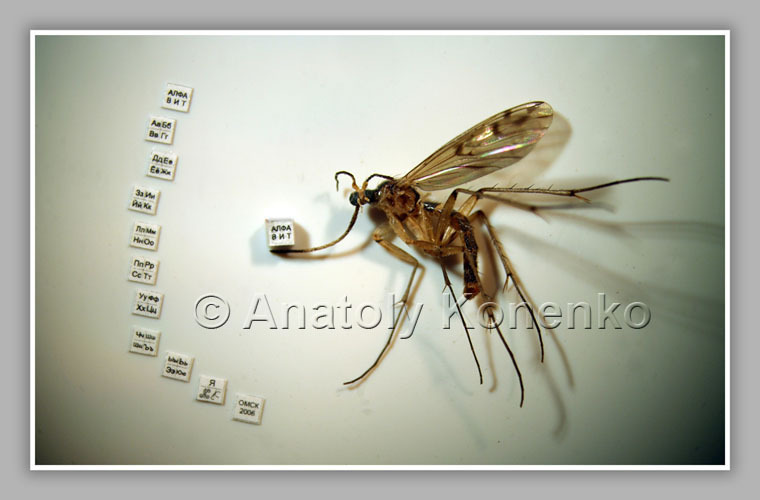 Text and image are printed with a matrix having dimensions of 8.0 x 11.5 mm. 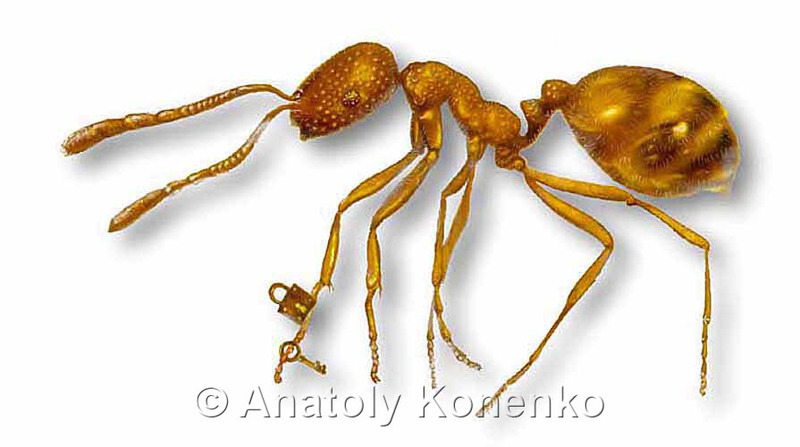 Locomotive height 0.24 mm of gold is placed on the hair. The thickness of the gold plates from which the following details of the locomotive 0.0032 mm. 5.6 x 6.6 mm, watercolor, mammoth bones. 11.5 x 7.6 mm, watercolor, mammoth bones. 16.0 x 13.5 mm, watercolor, mammoth bones. Portrait made of individual pieces of hair in different shades. Hair Thickness 0,08 mm. 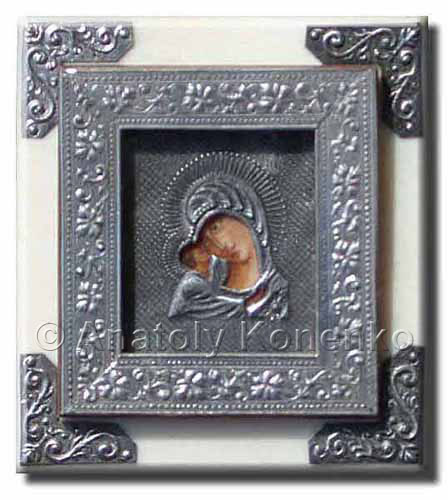 Mosaic is placed on natural mica. 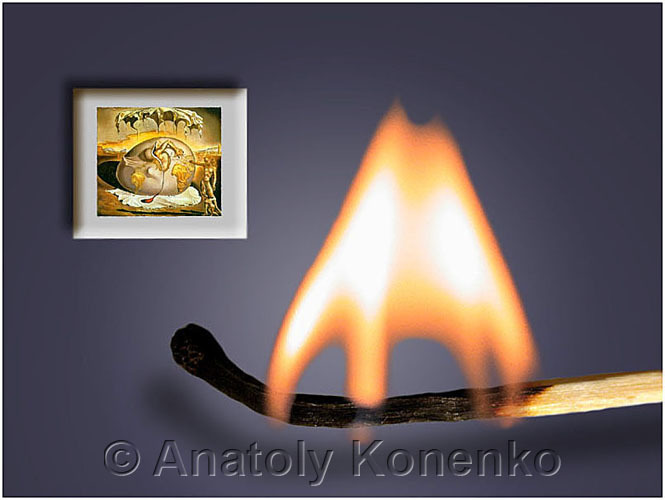 Candle of stearin with a wick. Candlestick machined from a tree. 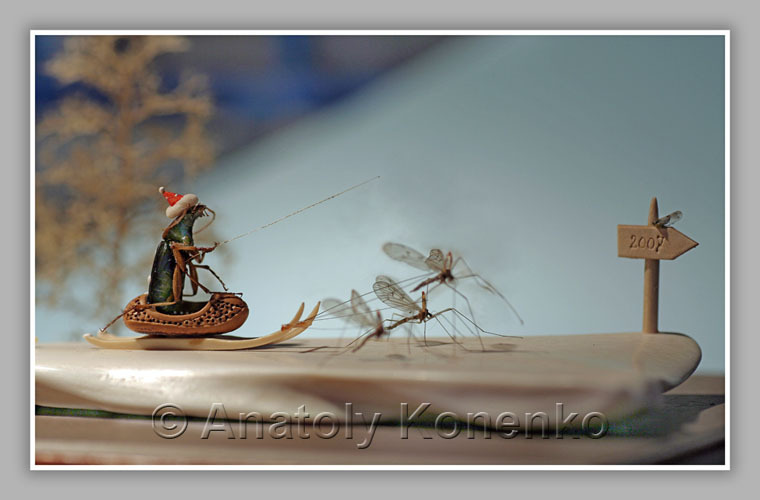 Microminiature with paintings by Edgar Degas. Executed in watercolor on the mammoth. Size 11.5 x 12.0 mm. 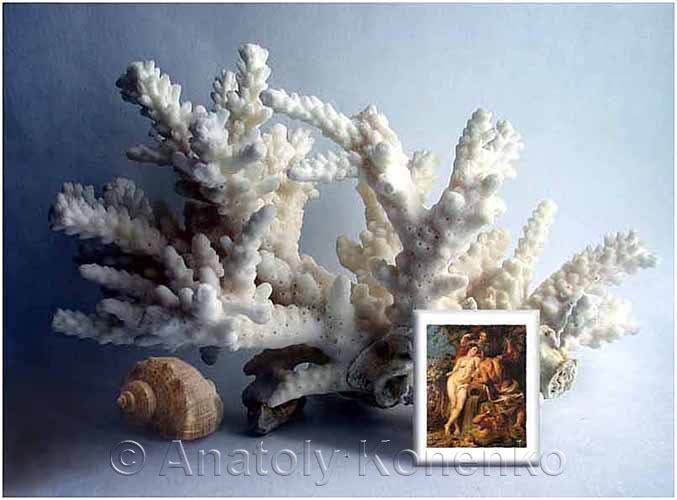 Coral crab from the Red Sea. 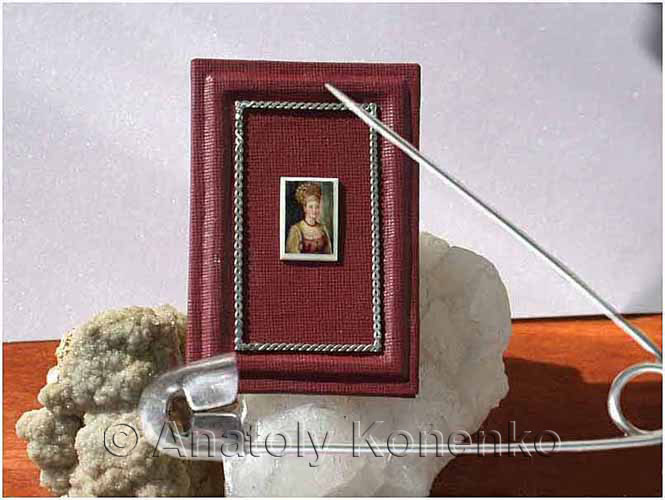 Microminiature a painting by Mikhail Shemyakin. Performed on the bones of mammoth. Size 10.0 x 10.0 mm. Length 6 mm. 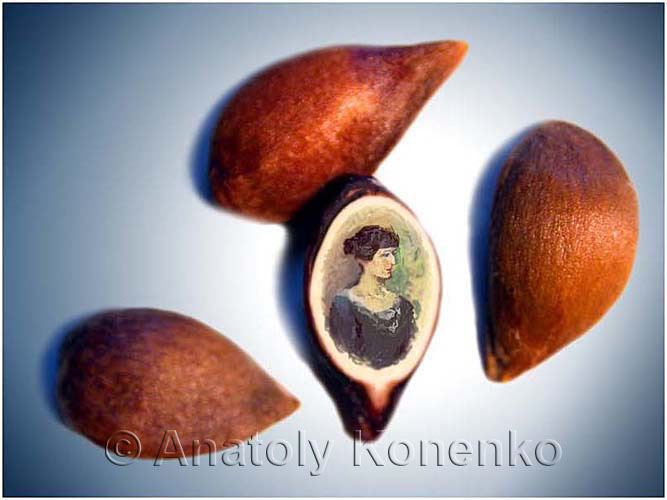 Is made of walnut, gold, apricot pits, plum and cherry. 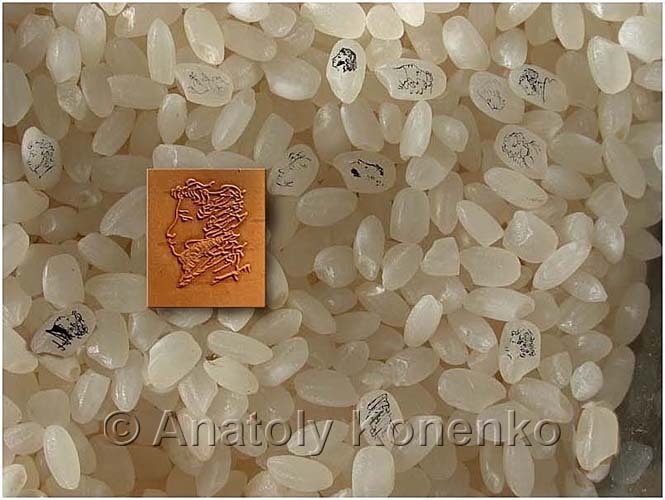 Portrait of Niccolo Paganini on a grain of rice. 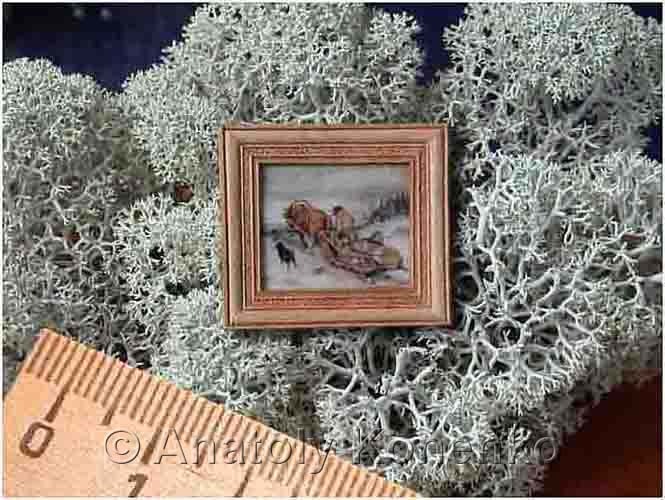 Microminiature with paintings by Rubens Peter Powell. 15.6 x 18.5 mm. 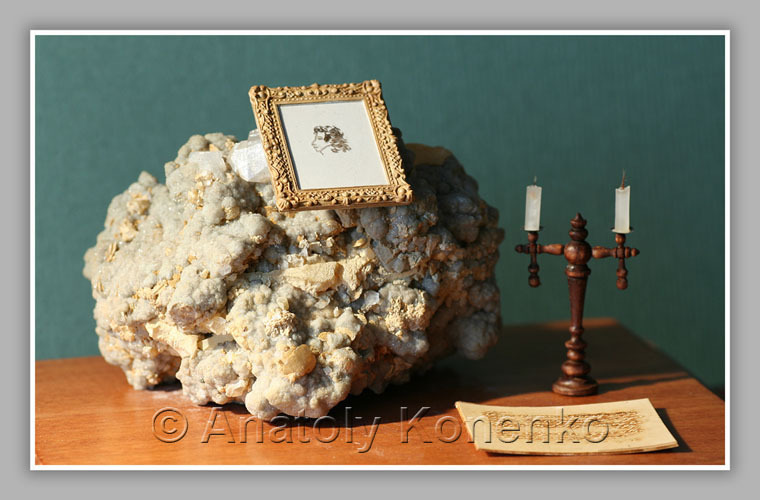 Watercolor, mammoth bone, coral. 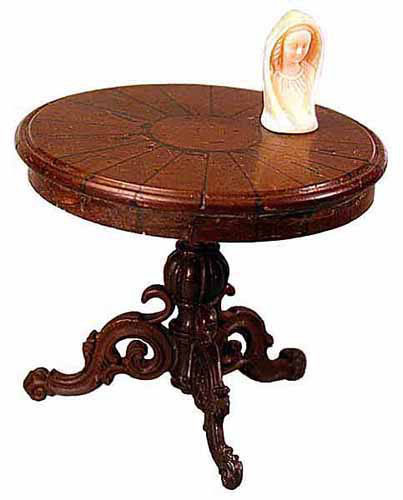 Table height of 35.4 mm. M 1: 24 (by world standards) machined out of a coconut shell. (glued together from 46 separate pieces). Madonna statuette 13 mm cut from a mammoth tusk. 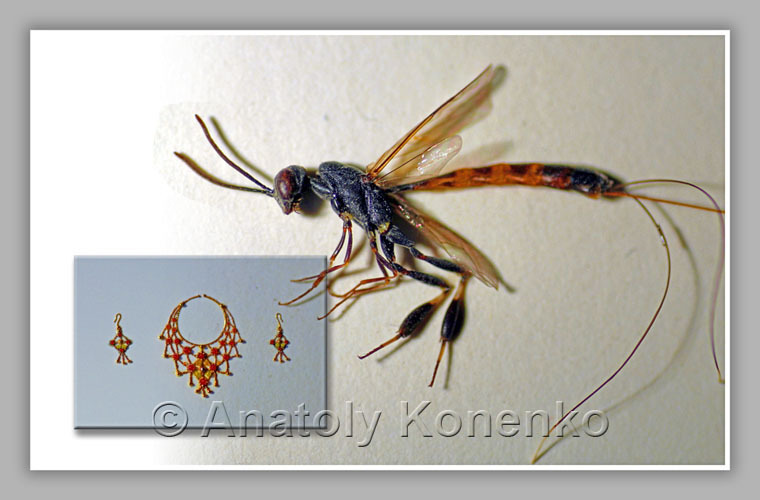 Microminiature with paintings by Fedotov. 16.5 x 12.5 mm, watercolor, mammoth bones. 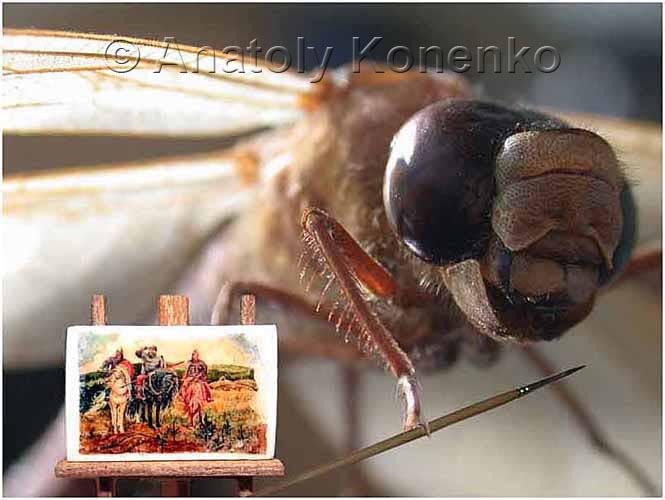 Dragonfly-artist paints a picture of V. Vasnetsov "Three heroes"
7.0 mm x 10 watercolor on a plate made of mammoth bones. Bas-relief on the bone peach. Dimensions bone 19.0 mm x 25 mm. 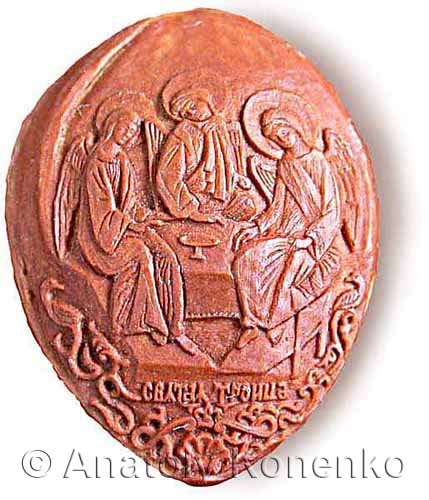 Microminiature with paintings by Andrei Rublev. 12.2 x 15.0 mm, watercolor, mammoth bones. M 1:12 (by world standards). Minicomposition "Lesson of the world"
Globe diameter of 6.2 mm machined from a mammoth tusk. It stands for all the continents and their name in Russian. Carried out the parallels and meridians. Statuette boy machined from mammoth bone and has a height of 20 mm. 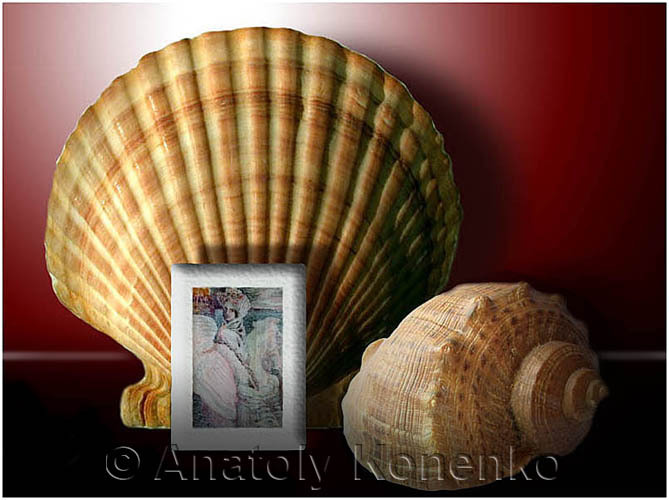 Subminiature icon executed in watercolor on a plate of mammoth tusk. 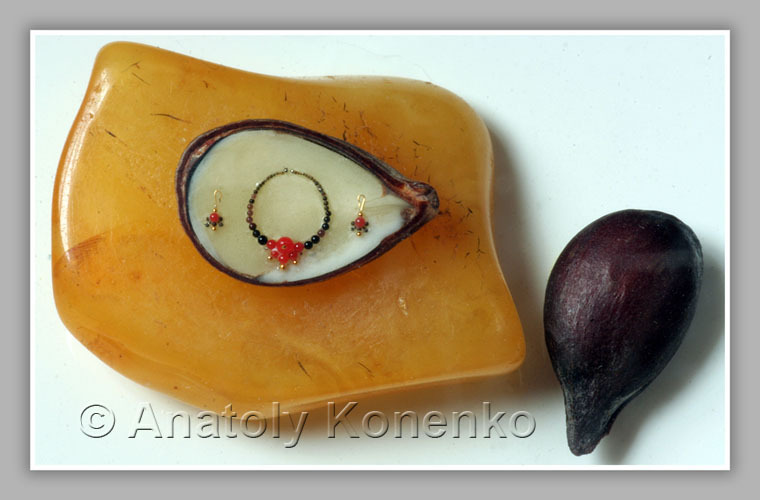 Size 5,0 x 7,0 mm. 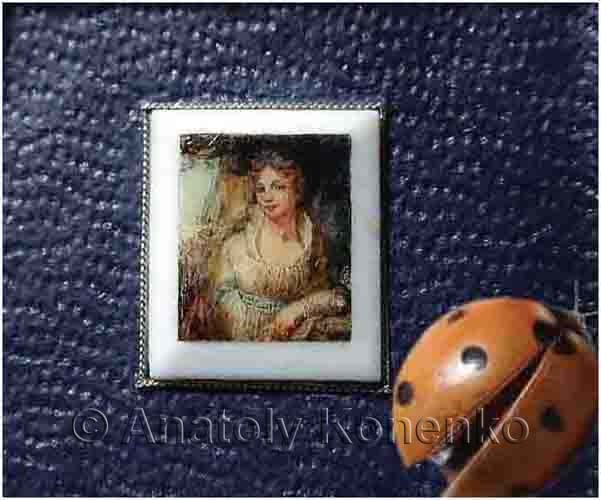 Microminiature with paintings by Bryullov. 15.6 x 12.6 mm, watercolor, mammoth bones. 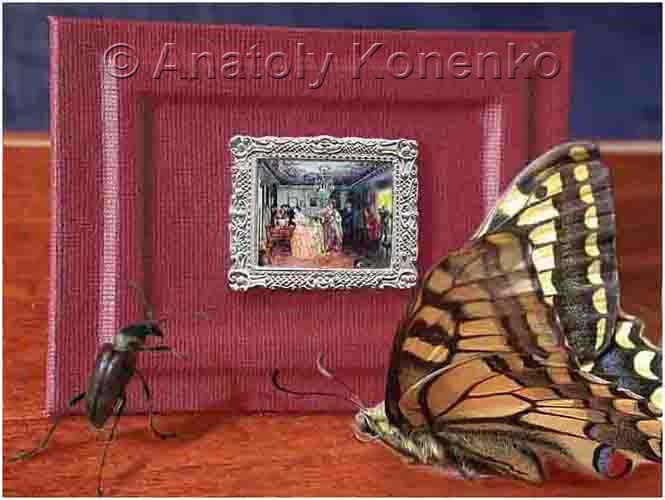 Microminiature with paintings by Ivanov. 19.5 x 13 mm, watercolor, mammoth bones. 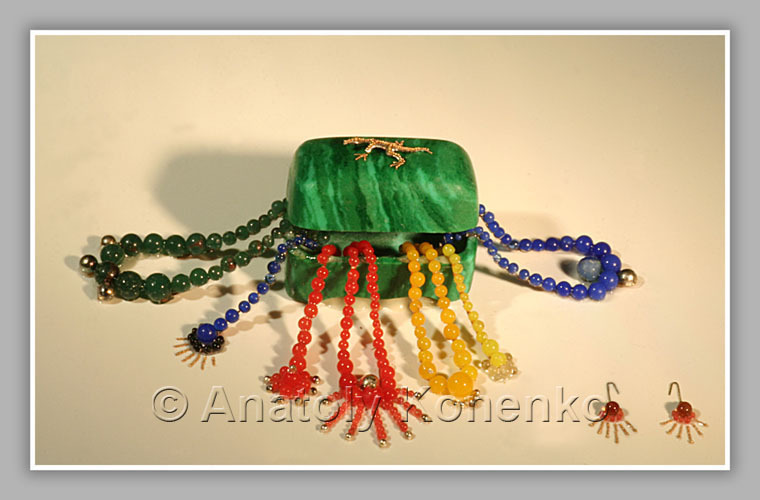 Beads of glass, silver and gold. Silver lizard 3 mm long. 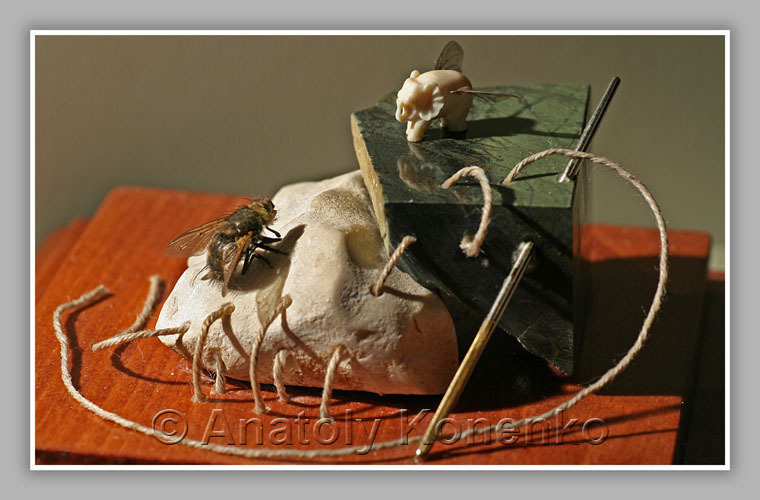 Composition "Dont make mountains out of molehills"
14.6 x 14.9 mm, watercolor, mammoth bones. 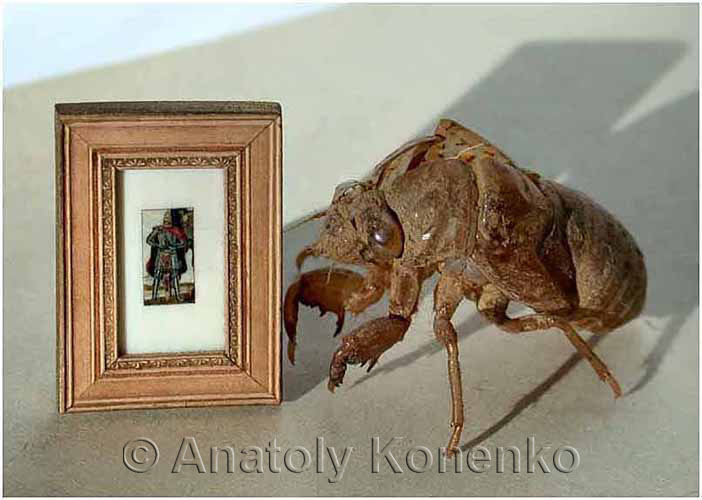 Microminiature a painting by V. Vasnetsov. 10 x 7 mm, watercolor, mammoth bones. to cut an apple seed. Glass. Gold. 2,7 mm. 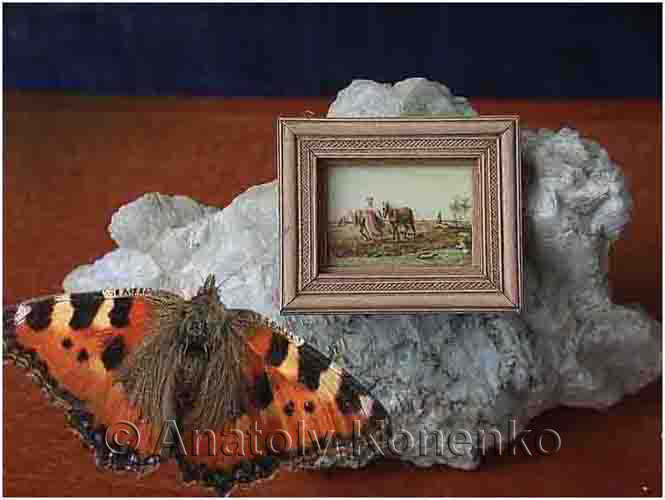 Microminiature a painting by Perov. 16 x 13,5 mm, watercolor, mammoth bones. 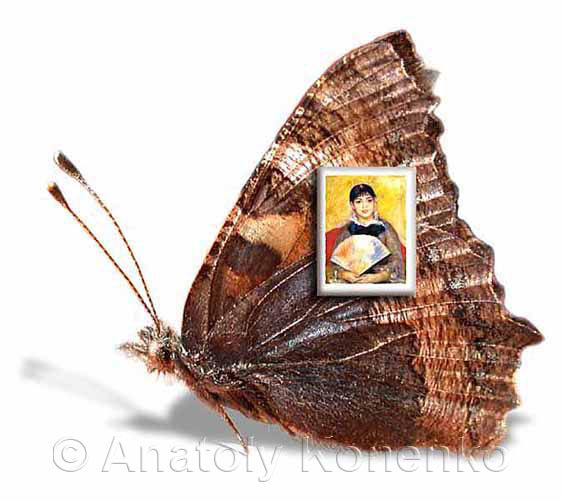 Microminiature a painting by Serov. 15 x 12 mm, watercolor, mammoth bones. 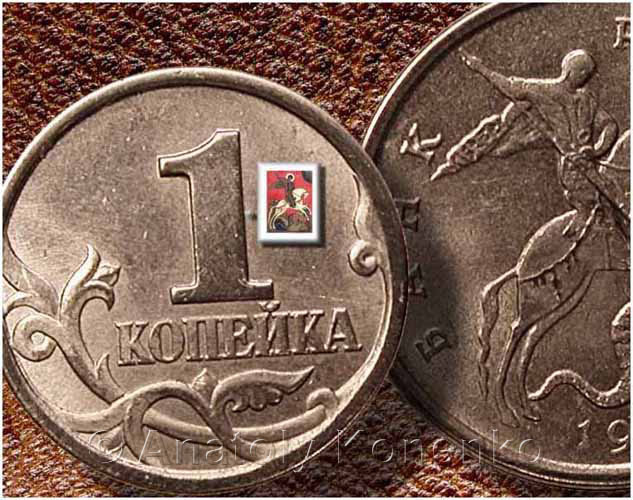 Supermicrobook 0,8 х 0,8 mm. 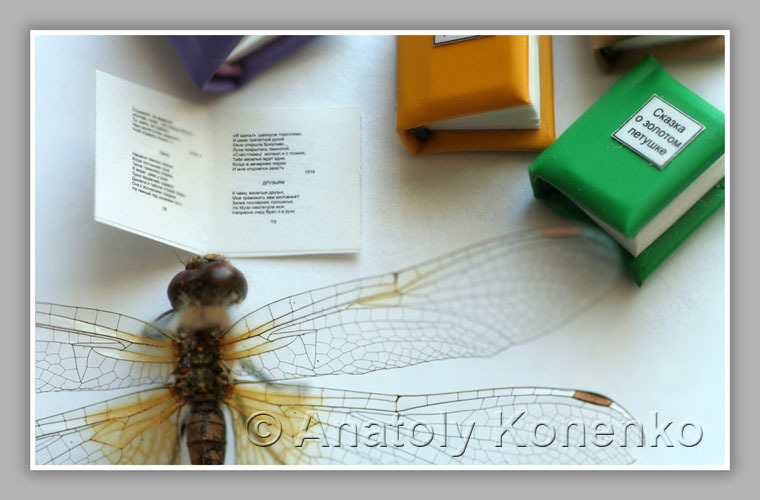 A series of "Alphabets of the World". (12 mm). The violin has all the details of a real instrument.